This attractive Finnhouse, newly constructed in 2008, is comfortably furnished and ideal for a family with children. The children have a wonderful garden to play in. You have a lovely veranda where you can enjoy the sunshine starting in the early spring. Like all Finnhouses, this villa is almost entirely made of wood, giving the interior a very warm atmosphere. The same warmth radiates from the tasteful furniture, with a cosy layout designed to make your holiday a success. 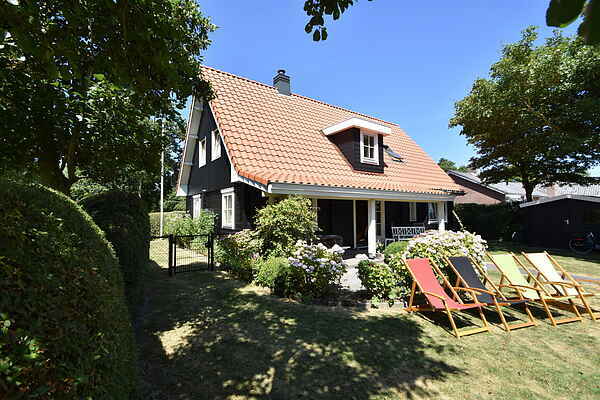 In just ten minutes, you can walk through the park and the dunes to reach the beach and the centre of the charming village of Domburg, with its many shops, restaurants and pavement cafes in a beautiful location right by the beach. The vast forest and dune area called 'De Manteling' is a ten minutes walk as well. Between mid-May and mid-September, you can reserve your own beach hut on the beach of Domburg (for daytime use). Zeeland has many beaches, and a visit to the Eastern Scheldt storm surge barrier (Oosterscheldekering) is truly a memorable experience. Vlissingen and Veere are also worth a visit.